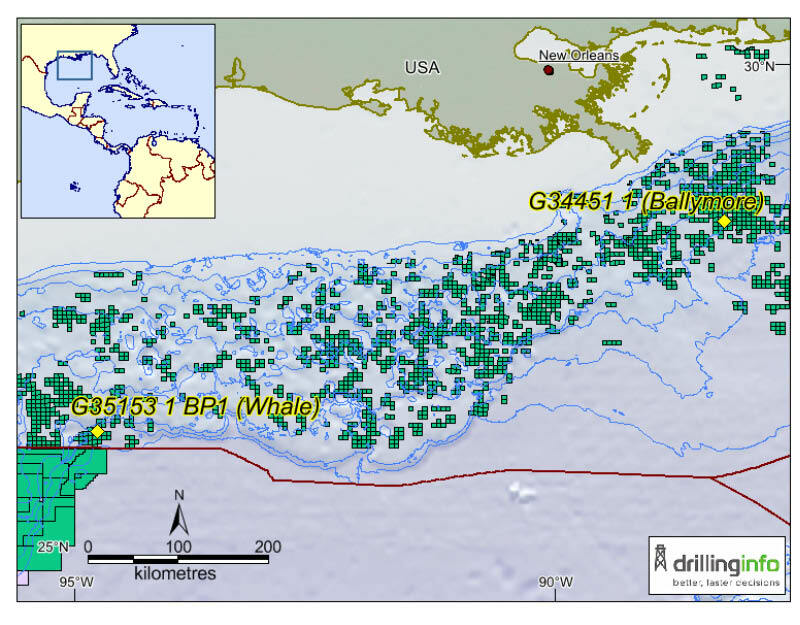 Location of Chevron's Ballymore discovery well & Shell's Whale 1 NFW discovery well. Image source: Drillinginfo. Chevron’s G34451 1 (Ballymore) well in the deepwater (1,988m) Mississippi Canyon 607 block in the Gulf of Mexico encountered 205m of net oil pay, in a high quality Norphlet reservoir. The well, about 5 km from Chevron’s Blind Faith platform and 80 km from the Louisiana coast, spudded in July 2017 and reached a final TD of 8,898m. A sidetrack well is currently being drilled to further assess the discovery and begin to define development options. Equity in MC 607 is shared between Chevron USA (60%) and Total (40%). Another Gulf of Mexico success story came at the end of January 2018, when Shell reported that it had encountered over 427m net oil-bearing pay in its Whale 1 NFW in Alaminos Canyon Block AC 772, near the ultra-deep Perdido spar, about 322 km off south-east Texas. The discovery lies up-dip of the Tobago and Silvertip fields. Block 772 is shared between operator Shell Offshore (60%) and Chevron USA (40%). The Perdido Field complex is one of the deepest and most remote developments in the world, spurring a string of similar discoveries in recent years to the south in Mexican waters. This update is brought to you by Drillinginfo.